Cvent has chosen the Yamaha YVC-1000 as its conference phone of choice to support the audio for more than 225 video conference rooms the company has worldwide. The Yamaha YVC-1000 met Cvent's requirements for audio quality, ease of installation and operation, Zoom interoperability, and global scalability. "When you communicate with team members all over the world like we do at Cvent, sound is the first priority. Out of all the brands we tested, Yamaha UC was the only company that made a product that went beyond a traditional speakerphone and felt natural in terms of the sound output into the room," said Pradeep Mannakkara, chief information officer at Cvent. 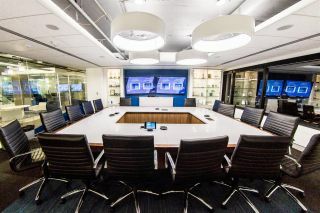 Worldwide, Cvent has 17 offices, more than 3,500 employees, and hundreds of conference rooms around the world, many of which previously featured an AV system that was challenging to install, riddled with poor audio fidelity, and complex to troubleshoot. Rather than continue to build out its conference rooms with that system, the company invested in Zoom rooms. "We demoed just about every audio product out there, and when we ran our tests on the Yamaha YVC-1000, our team unanimously agreed that it sounded the best. It was hands-down the clear winner," said JayJay Kim, senior AV systems engineer at Cvent. The YVC-1000's plug-and-play simplicity also allowed participants to get started quickly. Users only had to connect the unit into a computer's USB port and press the auto-tune button the first time it was used to optimize the audio to the room conditions, and the conference phone was ready to go. Because the unit learns from the environment, there was no additional programming required, eliminating the need for a specialist to set it up. Since deployment of the Yamaha YVC-1000, Cvent audio-related help desk tickets have almost been eliminated.